Need a dinner idea? Here’s what I made for the company lunch last Friday! Doesn’t it look amazing? 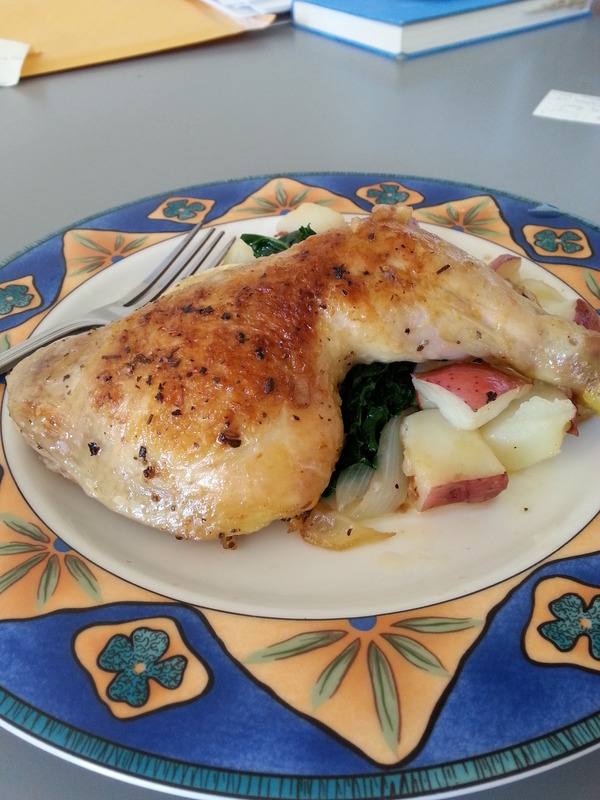 That leg’s sitting on a bed of sauteed kale and roasted potatoes that were in the same pan as the chicken so everything was so delicious and moist. I even made it all in just over an hour! Most of the cook time was really just the chicken and potatoes sitting in the oven, so it’s really just 15 minutes of prep! 1. Boil potatoes for about 7 minutes. Drain when almost cooked and toss with salt and olive oil. 2. Season chicken with salt and sage. Sear on both sides in oiled pan on HIGH heat for colour, takes about 3-4 minutes each side. 3. Remove chicken from pan. Saute onions and garlic in oils in pan until fragrant. Layer potatoes and chicken over onions and bake uncovered at 380F for 50 minutes. 4. Broil 5 minutes for colour and serve. 1. Boil water and soak chopped kale for about 1 minute, drain. 2. Saute garlic with olive oil in hot pan, then add kale. Season and serve. It’s easiest to start the kale when you have about 15 minutes left on the chicken legs since you can chop up the kale and get the water boiling right before turning the stove on broil to get that lovely golden colour on the skin! It’s quickly turning into Fall in Toronto and it’s making me want more and more hearty foods. Luckily, I’ve been trying new recipes by cooking lunch for the bi-weekly team meetings! I’m not sure if it’s a good thing or not, but I’m cooking for a team of 5 (including me) and I’m the only woman here. How is that bad? It means that I’m cooking for 4 adult men under the age of 35! It’s so much food and 3 of them are French! I cooked this last week, so you might’ve been able to see this if you’re following me on Instagram! It went over super well! Each bite is a little different with little chunks of havarti cheese scattered around with the crunchy bacon and a fragrant hint of rosemary in the mix. The best thing aside from the bacon is that it’s easy to get it done in about an hour with a little bit of good time management! 0. If using frozen, take the pie crusts out of the freezer now to defrost and puncture when instructed. Otherwise, keep your prepared pie crust aside. 1. Cut potatoes into small cubes, about 1/2 cm wide. Set to boil in salted water for 15-20 minutes, or until tender, then drain when ready. 2. Meanwhile, cut bacon and gently fry on MEDIUM heat in shallow pan until crispy. Set aside the bacon on a shallow dish lined with paper towels to drain. Retain about 1 tbsp fat in pan and discard the remaining fat. 3. Chop garlic and onion and fry in bacon fat on MEDIUM-LOW heat. Add rosemary when the onions become translucent and continue to cook for about a minute until rosemary is fragrant. 4. 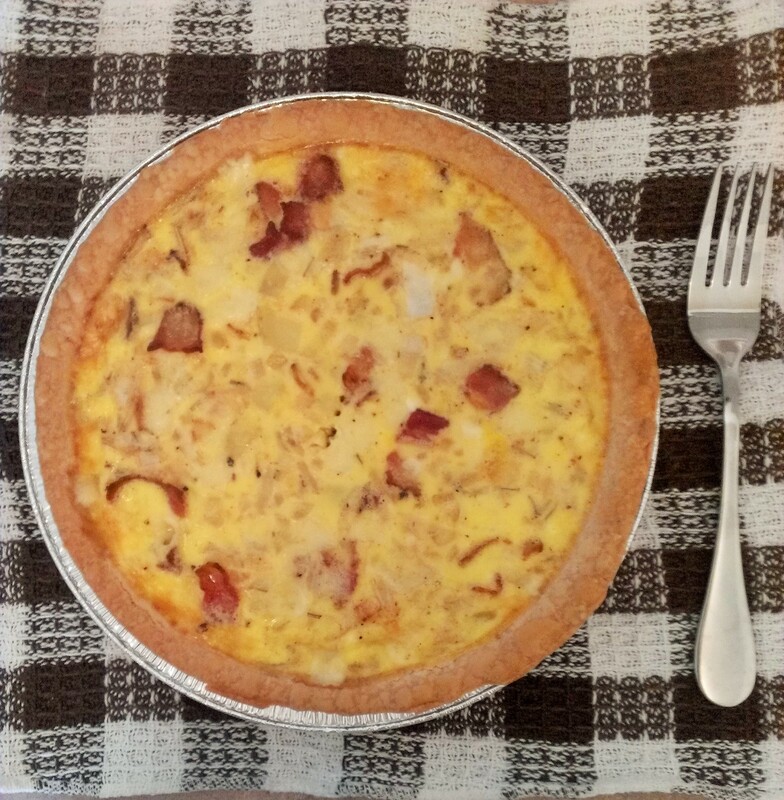 Arrange layers of potato, bacon, onions and havarti cubes in even layers in your pie crusts. 5. Whisk eggs and milk together. Season with salt and pepper. Carefully pour over the layered quiche filling until just covering the top. While the quiche is baking in the oven, it’s pretty easy to get a quick green salad tossed up with some sliced cucumbers, grated carrots and raisins or a devilishly easy hot side like blanched and pan fried green beans or broccoli. Anyway, it’s a small company and my colleague completely understood, so everything turned out okay. But, it left me with a problem: I didn’t have a lunch. What to do? 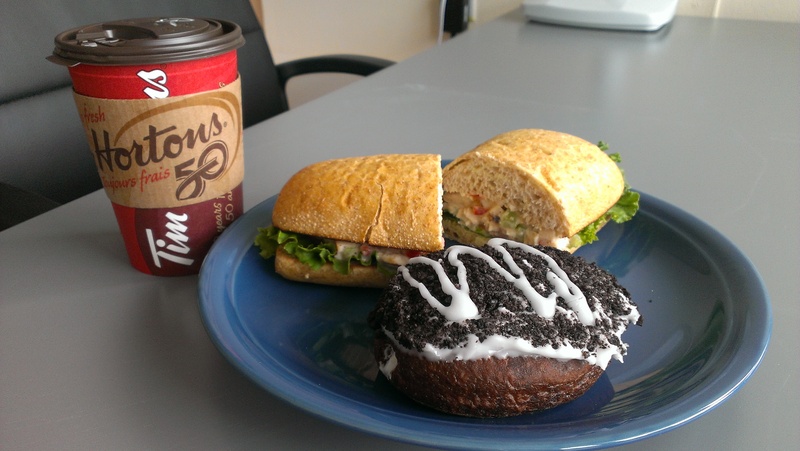 Tim Horton’s to the rescue! I know, I know, it’s so lame compared to the fantastic sandwich from Bukamaranga I posted before! But, there’s almost nothing affordable for lunch in this area except for Tim Horton’s and Subway and I knew that the new Oreo donut had just been released. The Oreo donut has a chocolate dough base and topped with white icing and Oreo crumbles, then further drizzled with more white icing and filled with sweetened cream. My first impression was that it’s so super sweet because it’s sugar on sugar and then stuffed with more sugar! I’ve had some pretty awesome donuts before, but I don’t think this is it. However, the donut was really stuffed with the creme filling and, even though it got a little mangled on the way back to the office, it was nicely presented. The big question is: Does it taste like an Oreo in donut form? For me? Not really. Oreos are made with cocoa, so the bitterness of the chocolate flavour should balance the sweetness of the icing sugar inside the cookie. That’s one of the reasons why Oreos taste so good! But, the donut doesn’t have a lot – if any – of the cocoa bitterness that Oreo cookies have. It’s still a neat donut to try out if you like Oreos, but keep in mind that it costs a bit extra compared to their normal selections. My meal came up to be a bit higher than usual at around $7.15, but that was fine for me today. Eventually, I’ll get around to trying their Oreo Iced Capp. Eventually. Today was one of those days that took me from one end of the GTA to the other and back. I needed to take measurements, tackle traffic, talk to some partners, grab some samples, drop off samples and somehow squeeze in some lunch before making the hour-long trek on the 401. After I took care of the samples, I checked my GPS to see where’s the nearest place for me to eat. It led me to a small plaza-esque area where there was a McDonald’s, Subway and a Wild Wings. Yay. Right as I parked the car, I noticed a quaint little cafe that opened up to the parking lot called Bukamaranga Bean & Bagel Company. Curiously, it was almost empty at 1:30pm on a beautiful Friday afternoon, but it immediately brought back memories of the open-air cafe by the Woodbine Beaches. I went by pure instinct and stepped in for some lunch. It looked clean enough! And boy, was I ever surprised! 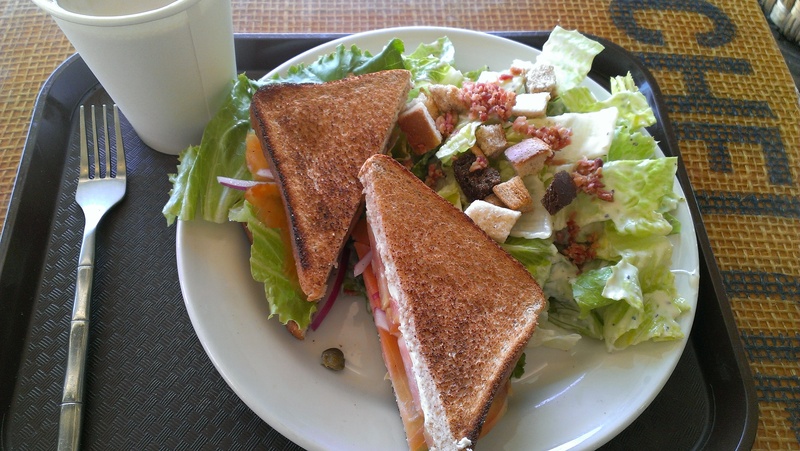 A smoked salmon sandwich with tons of dill and garlic cream cheese, lettuce, tomato, red onion, capers on whole wheat toast and a generous side of fresh caesar salad! With an amazingly delicious coffee, the total came up to $11.50 after tax! A Big Mac combo at McDonald’s is almost $10 now anyway, so you can see why I’m always on the lookout for local, delicious cafes for lunch.